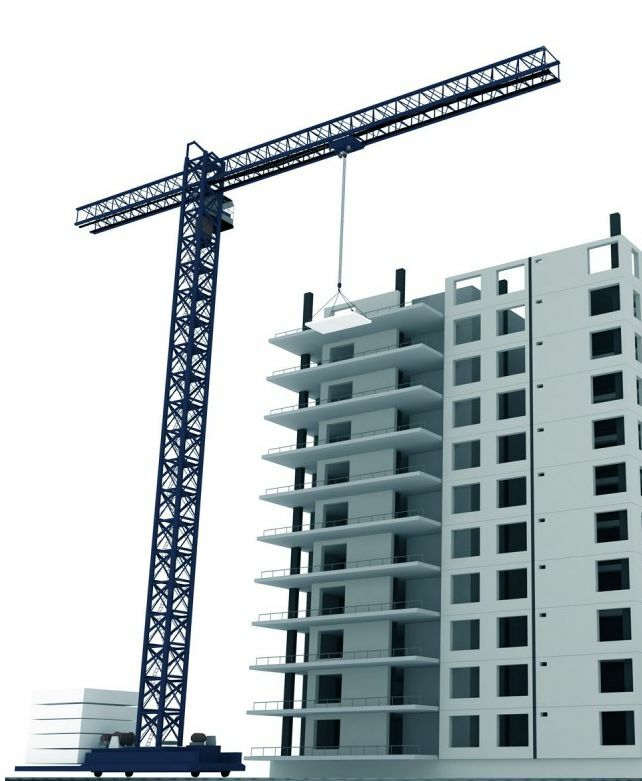 Buying a pre-construction condo may be the most exciting investment anyone can make. Like any investment, you have to do the math with all professionals involved (mortgage, real estate etc) before you make the jump! In addition, yes! you should research the developer and the builder in the same way you research about your carmaker before you go buy one! 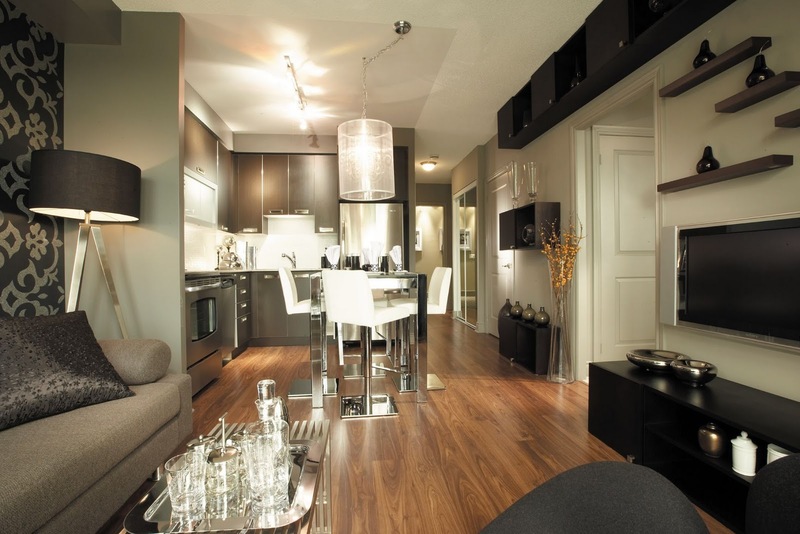 Investing in a condo should be dealt with like with any other long term investment, look for sound advice if you’re not sure how to assess the value of your condo. My focus is on the interior space you are buying for your own enjoyment and what I can help you with is to find out if you are actually buying the lifestyle you deserve. Creating an interior space just for the sake of “looking cool” does not interest me much and I have a feeling it does not excite you that much either :) unless we’re just playing with decorating ideas. 1. When interested in a small space, look for most of the space being utilized properly- you have heard the term “wasted space”- this image shows how a long corridor can be utilized, you can use narrow bookcases or built in units (like one of my designs in the image on the right side- used primarily for decor and small storage items) however the area marked in purple on the floor plan shows how much space is actually used only for traffic. This is why I recommend to look for layouts where the main foyer is shortened in favour of other areas. 2. Ceiling height- one important factor to consider. Whether you’re looking at a small or large space, a 9’ ceiling height is ideal as it will give you many space design opportunities- full height features increase the visual perception of the overall space. 3. 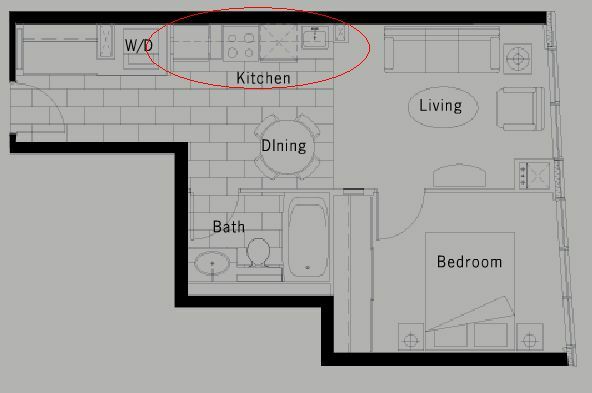 Kitchen and Bathroom- how current is the design and how much cabinets storage is provided. This unit for example- it is definitely for people who do not cook! Because there are no lower cabinets for pots and pans, (upper cabinets are only 14” deep max). Also, keep in mind the advantage of having brand new appliances and plumbing fixtures! Most developments offer current selections, so I wouldn’t worry about buying something ‘not so trendy’. 4. Features List and Finishes- Too many times people are intrigued when they move in their first condo to find out there is no ceiling fixture in the bedroom- and we’re not talking about a capped fixture (in which case you can buy and install a fixture), we’re talking about no junction box whatsoever. As you can imagine, adding one in a concrete ceiling is virtually impossible so you have to live with track lights (not a winning design!) 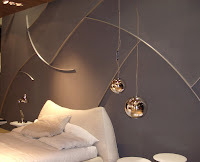 or floor lamps, but the light beam is not the same as with a ceiling fixture. So my advice is to read every single document you obtain from the sales centre before it’s too late. When it comes to Finishes- pay attention to what is included in the Standard list and what are your options for Upgrades. The more choices the better, of course! See if the upgrade finishes boards looks good to you, so you avoid spending money later on ripping out tiles and installing yours- it’s more costly for sure. Decide now if you want a bathtub or a shower, the expense of replacing it after you move in may be much higher than you think (unless you are a contractor). 5. Orientation- are views important for you? then always consider what is in front of your building AND the size of your windows. You should consider if natural light is important to you. Everything changes when you have smaller windows- the paint colors don’t look the same, the overall open feeling is not as strong as with full height and wall to wall windows, however it gives you more wall space and it is easier to incorporate a traditional design, eclectic or a mix- therefore you should consider the type of furniture and furnishings you like. 6. Overall storage space- this one is always tricky. You always have the option of buying a storage unit, if you are very selective on what you store inside your codno unit. You may consider storing off-season clothing in a storage unit OR look for a condo with at least one walk- in closet OR consider converting a small den into a walk in. 7. 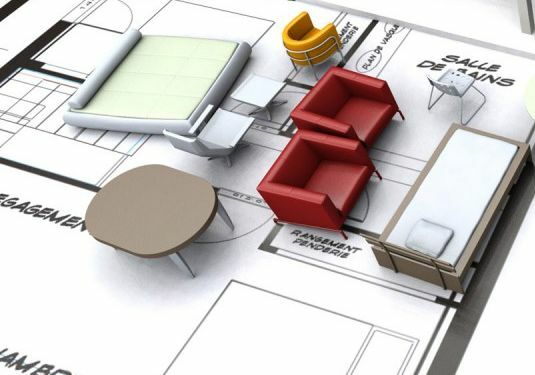 Furniture Layout- when you go to a sales centre where marketing plans don’t have the furniture shown, I highly advice you to do a simple exercise and try to lay out the furniture you already have or intend to buy. You may have few surprises- and better now than later. Not sure how to do it? 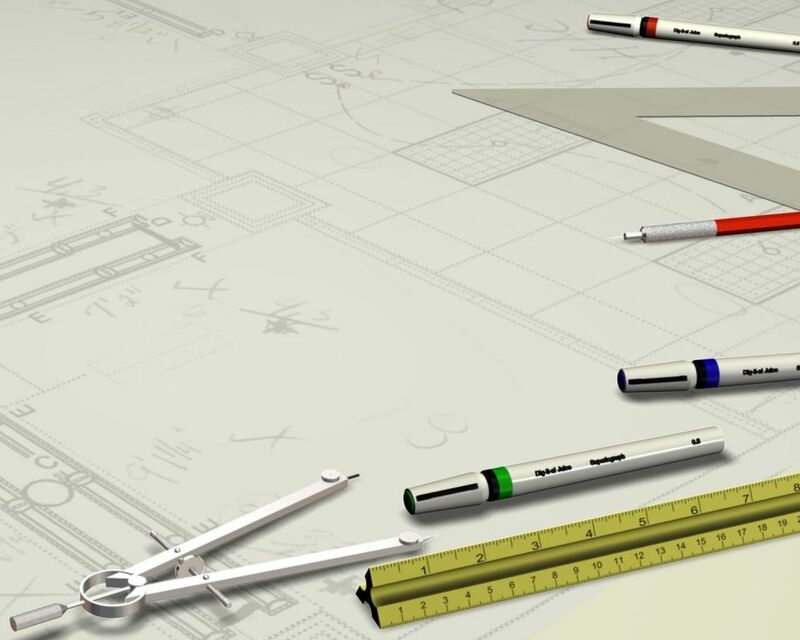 Send us the plan and we'll do it for you right here on this blog! 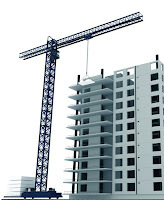 Would you like to know specific questions to ask when pre-viewing pre- construction condos? Stay tuned, I am about to reveal many detailed design questions that should help you be an educated buyer before you step into a sales centre! Make sure to enter your email address in the yellow bee box on the right side to be notified before this information is posted. It could save you a lot of money, just because you will know what to look for! Bottom line- it is all about your lifestyle! Always ask what your options are when choosing upgrades. Can you only upgrade finishes or can you also add more lighting? Some developments allow for different types of customizing your unit so ask for all the details. Know all your options before you it is too late. Too many times people call designers and ask for pot lights when there is a 8’ concrete ceiling!? Buying a condominium should be very rewarding, that is IF you analyze carefully your needs and what the interior space has to offer. 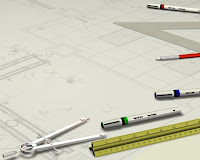 The interior elements are only one small part of the equation- discuss all your options with your lawyer, mortgage consultant and of course the real estate agent who should be able to put together many pieces of the puzzle. Small spaces have it, large spaces have it, rectangular, square or even round spaces have it- an area or element that could be featured better than another. 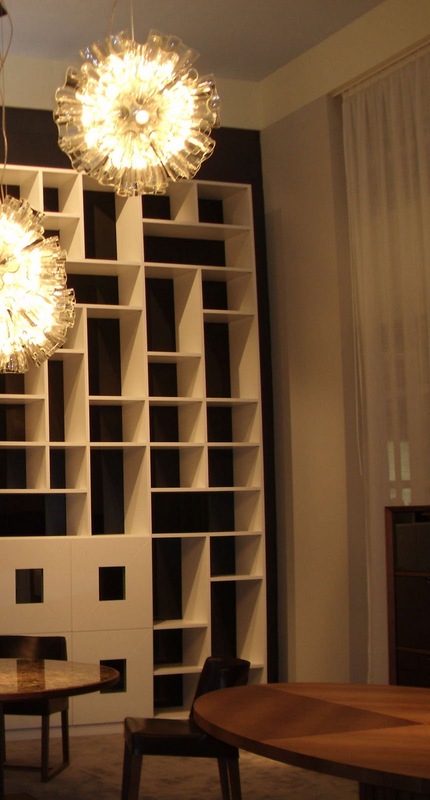 You've probably heard before the term “feature wall”. 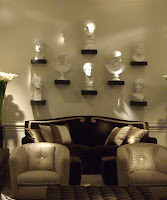 Whenever I help a condo owner design their space, they are asking the question “how to create a feature wall”. 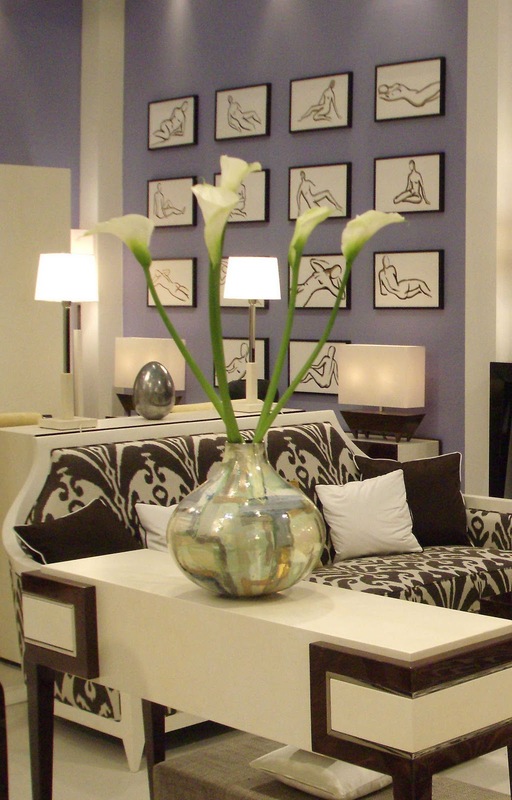 There are no rules when it comes to feature walls or other feature elements in your condo space. You can have monochromatic spaces where one element stands out as a feature (it doesn’t have to be a wall) and you can have high contrastic finishes and create featured areas. When you try to create a feature, think of what you see first when you walk in that space, think of creating something distinctive. Keep in mind that even a small open space living/dining can have more than one features, it all depends on how you direct the attention from one feature to another without overwhelming the design of that space. 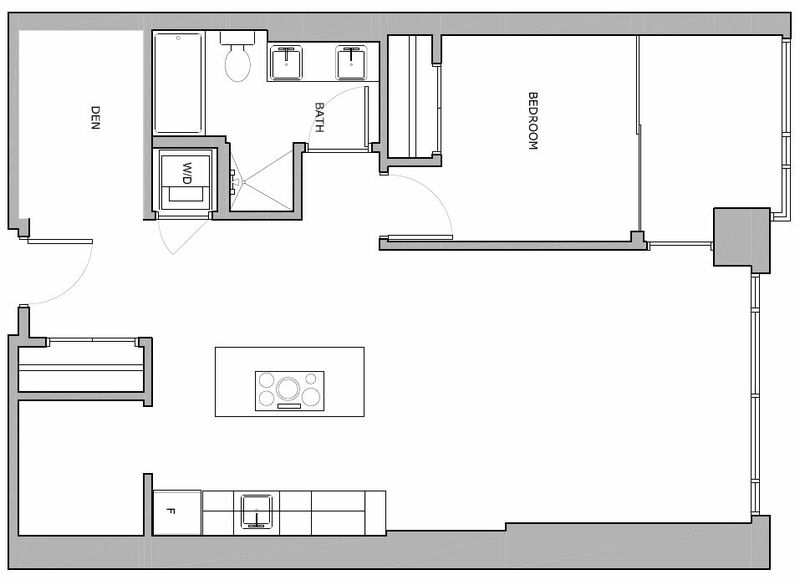 Today I want to show you one example of a condo floor plan of an average size of 796 sq.ft. 1 bedroom and den. 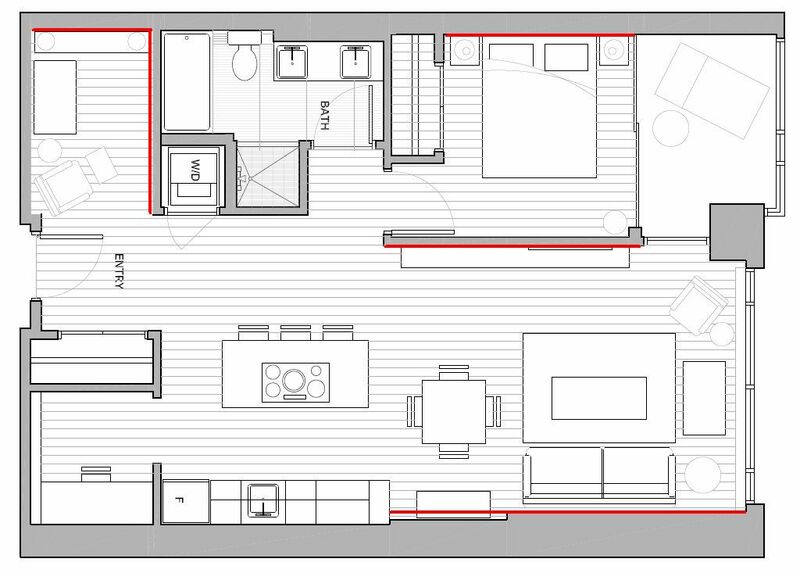 With one typical layout like this one, you could consider to feature the walls highlighted in red. Why? Think of what you see when you open the door. There are many possibilities when it comes to creating a feature in any space, here are some examples. Den areas are many times open spaces located close to the entrance and in best cases featuring 9’ ceilings. This is a great feature many times underutilized. If you are using your den as a library or home office, you have a great opportunity of using full height bookcases. 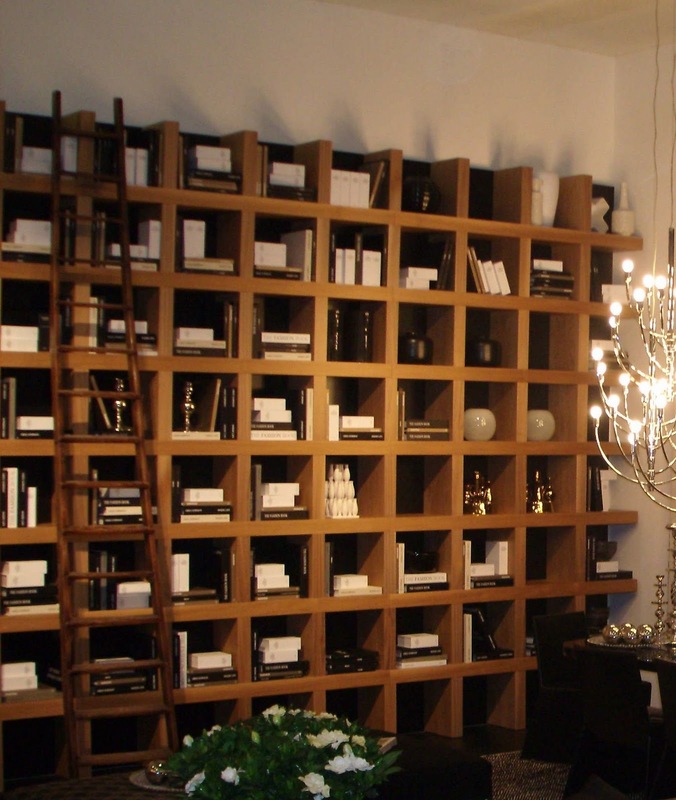 The design of the bookcases alone can create an interesting backdrop for a small den, hence keep the books monochromatic so the actual bookcase design does not get “lost”. 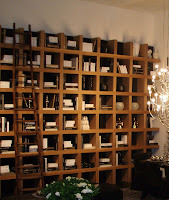 If you opt for a more uniform look for your bookcases with no intricate design, you can then play with the color and size of books and accessories placed on the shelves, however I would still try to keep a limited number of colors used in the book covers as it will create a more cohesive look. Custom wall art plays a huge role in creating feature walls. The image on the left is a small example of how you could create just a touch of wall art by using wall decals available at Home Depot! just type in the search box the word "blik" or go straight to Blik's website. 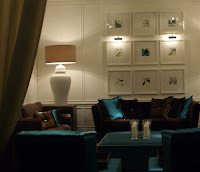 Another way of creating interest on a long wall is by adding artwork with similar motifs, same size and same frame style. 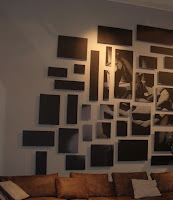 You can place the frames right above the sofa in your living room and use the entire length of the wall. I would suggest this approach especially for low ceiling spaces where the length of the room can be emphasized instead of the height. Each space has some great features and these are the ones with high potential for being featured! Here's another great example of how art can inspire your design. 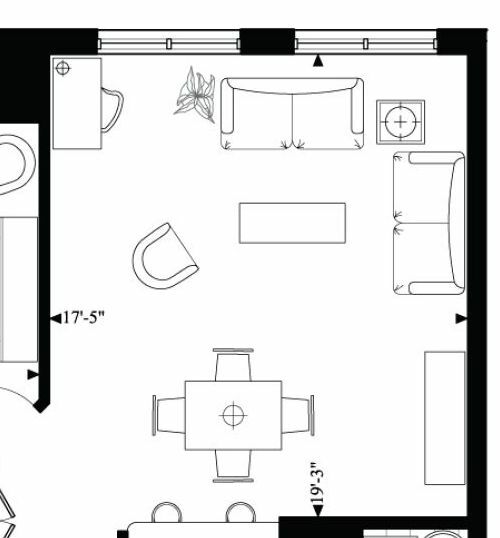 Many times I actually start designing an entire condo space from an idea I have about art. The image on the left shows how large scale photography can become a focal point or the feature wall in any area- you could use this idea in your seating area, den, bedroom or even in the dining area! One oversized image is split into several frames of different sizes and shapes. I like the flexibility you have with this idea- think of relocating to a larger condo- you can always plau with each frame and stretch the overall size of the artwork to what suits the new space. This is the beauty of abstract compositions! For a more classic look, you can create a feature wall with framed art- the trick is to use as many frames as possible, of the same size and shape. The image on the left shows how just a small punch of color can tie in with the colors used for the sofa & accent pillows and yet keep the wall and art frames in a "tone on tone" design language. The image on the right is another great example of using black and white framed sketches. It's the color of the frame that makes all images stand out when you look at this wall from far. 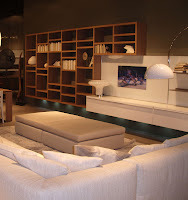 The white background works really great with the abundance of white tones used in the furniture and furnishings around. Bedrooms are great for feature walls. Most condo bedrooms have one large wall without any visual interruptions (created by mechanical vents or closet doors) and this is the best wall for creating a feature. There are unlimited choices, from using the headboard as the main feature and playing around it with artwork, mirrors, wall trim, paint colors etc. The image on the left shows a unique feature where few pieces of thin wood trim were wall mounted to create a unique design. You can come up with your own pattern and when using a dark paint color for the wall, you can consider painting the trim in very light color or using a metallic paint. 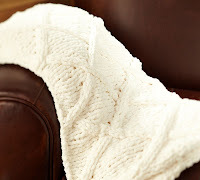 The image on the right is a great example of a more subtle feature- it's not the color or the contrasts, in fact I would love this feature in a "all white space"! 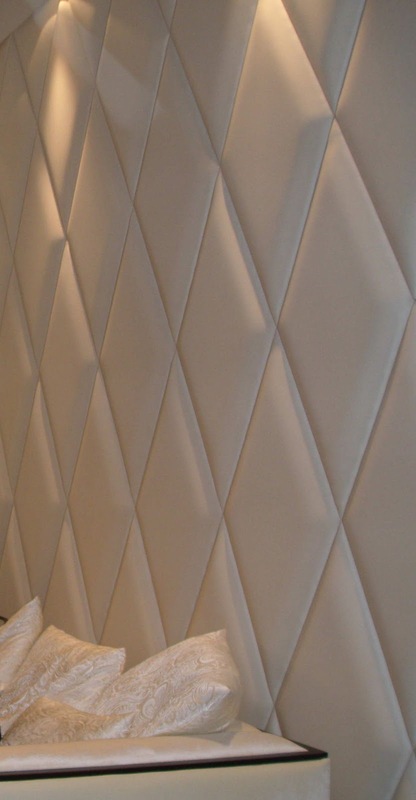 Upholstering the entire wall is a fantastic way of adding texture and interest without introducing a new color. Also it is a great way to better sound proof any room. 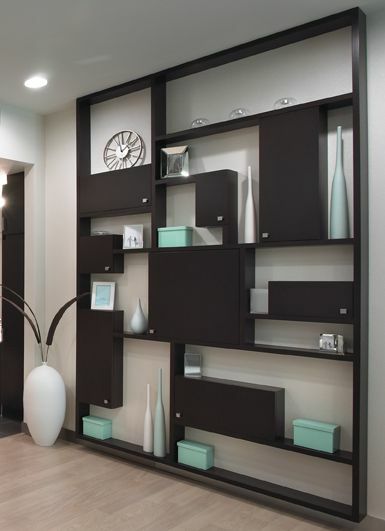 From living area to dining area to den to bedroom, a feature wall can be easily created! In the image on the left you can see how a seating area with a long wall right accross can become a feature. This is a great example of playing with bookcases and a tv unit, of different finishes and shapes, while creating one feature. When living/dining is an open space, by connecting them visually you make the space look larger and the design appears more consistent. Would love to answer your questions about condo feature walls! Post your comments and questions below. 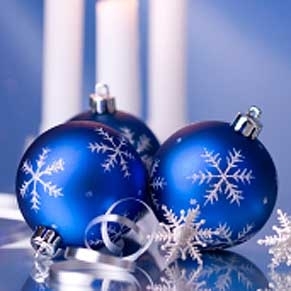 HOW TO DECORATE YOUR CONDO FOR THE HOLIDAYS? 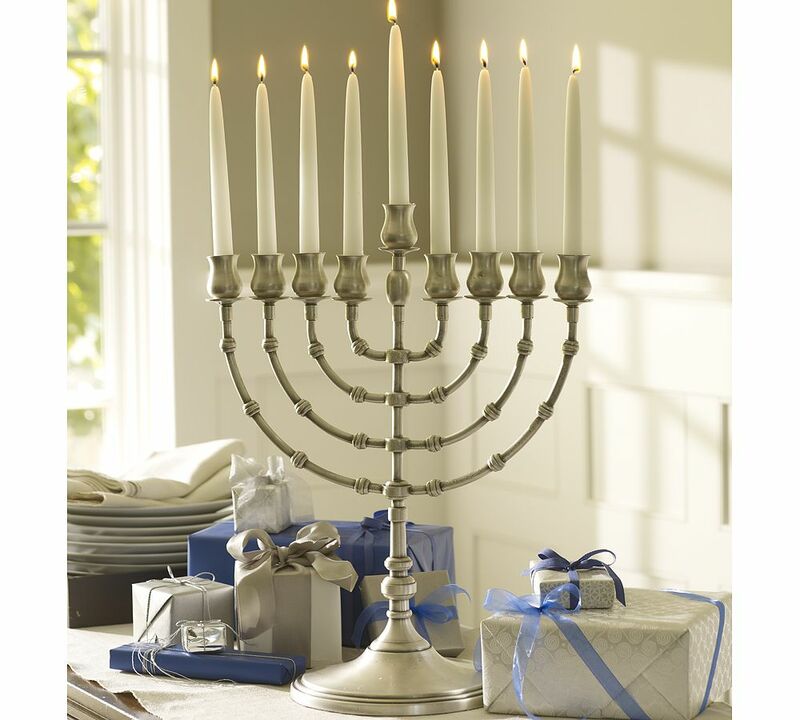 Whether you celebrate Christmas, Hanukkah, Kwanzaa, Diwali, it’s all about the light! Light fills the season with holiday spirit. Holiday decorations and celebrations have already started in many parts of the world and lighting creates a spectacle of its own. 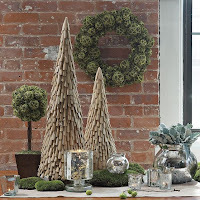 1st- real trees and wreaths represent a fire hazard therefore they cannot be used for any of the common areas of your condo and in most cases they are not allowed in your unit either. 2nd- your suite entry door is not really your door, well it is :) but you can’t use nails or screws to affix anything to your door. Your condo by laws (every condo owner has this book!) says exactly what you can and can’t do with your suite entry door. Best is to ask your property management as they may allow you to use double sided tape or Velcro. 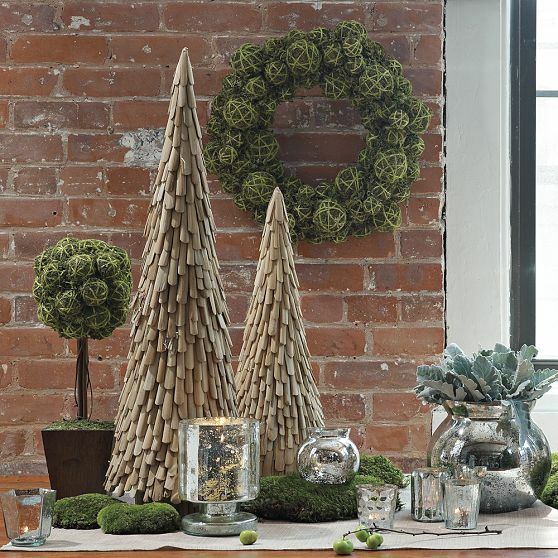 And yet, all these rules should not stop anyone from having a great holiday decor, EVEN in a small condo space. For few years now, I change the way I decorate for Christmas every year- mostly the accent color. It’s really fun to use a different color every year! there are so many choices in the retail stores, sky is the limit! What I would suggest to anyone wondering how to decorate a really really tiny condo space is to follow the power of 3! 1. the power of color. Yes, in some small condo spaces you can actually see the entire space right from the suite entry door. Using the same accent color from the foyer to the farthest corner of your space will actually create a consistent look and will amplify the effect of that color. I have experimented using consistency in color throughout the space and noticed most people say “wow” right after they walk in a space easy to read. 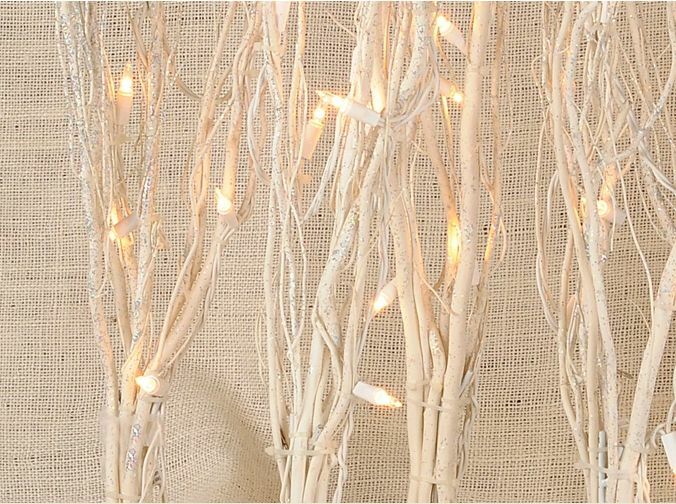 In love with white faux Chritmas trees? 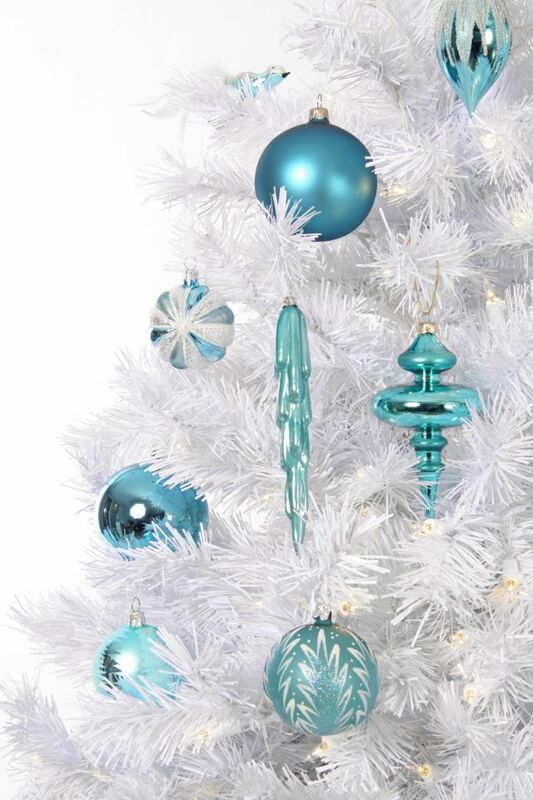 For those of you who opted for dark paint colors in your living area, I have to say that a white tree is THE BEST look! 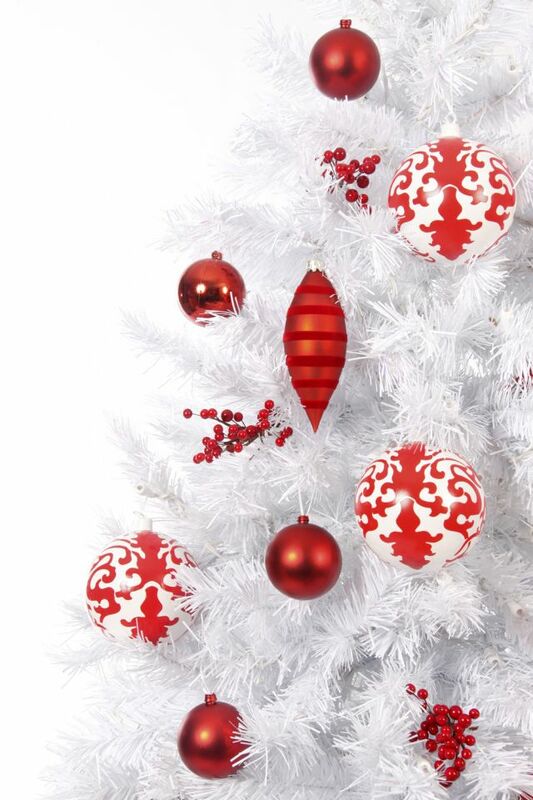 very sharp looking and if you think ahead how the color of your ornaments will work with your wall paint color, you've got a winner! 2. the power of grouping- some small condo spaces don’t even have a corner for a Christmas tree- no space? no problem! 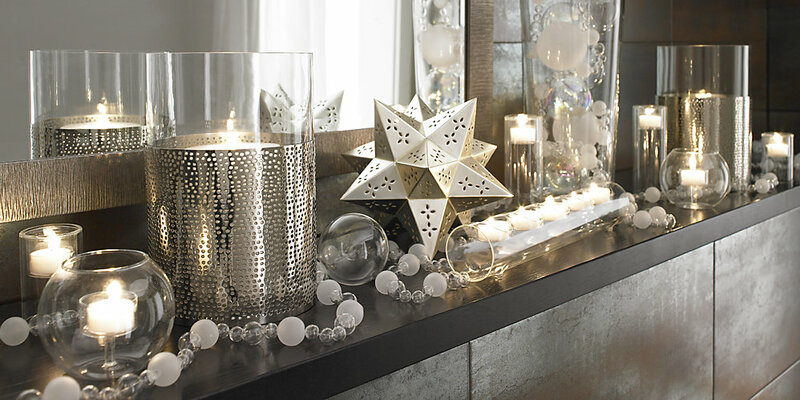 try to add a small detail starting with the foyer (perhaps a faux wreath) or candle lights on a shelf, then add something in every room including small accents in your bathroom, bath towels, bath mat, then living space and bedroom. And maybe you can’t fit in a full height tree, but I’m sure you can use one of those large vases filled with white branches or white and coloured branches (use again your decor accent color). 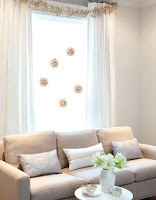 Think of ways to easy change the look of your accessories ( how about using different color & texture throw pillow cases, throws, window coverings and lights and even artwork!) 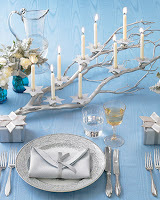 nicely coordinated with your decorations- all this for a much more powerful visual impact. 3. the power of lighting- you have seen it! 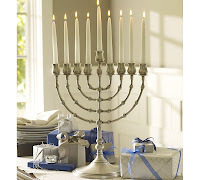 I have seen so many wonderful Menorahs and love to drive by houses where you see them lit in the windows. Windows decorations are really easy to do and you have as many options as in a house: Wreaths aren’t only for the front door, glowing candles are welcome in any corner of your living space, hanging icicles are all part of the holiday decor recipe. You probably know by now that LED lighting is the best way to go especially when you plan on having the lights on during the night. Depending on each condo property management, you may be allowed to use the lights on small artificial trees on your balcony. Even if it’s snowy and windy, your balcony is your little garden that could look very pretty after a fresh snow fall. Wondering what other people are doing for Christmas decorations and gifts? personally I find that before the Holidays it feels like everyone is running a marathon of "buying" frenzy, that sometimes we forget what the holidays are all about. I was really touched to find this wonderful example of just simply sharing the joy of Christmas, called Christmas in a bottle. "We filled mason jars with many cute little holiday treasures, wrote a sweet note on a star, tied them up and sent them off into the ocean. 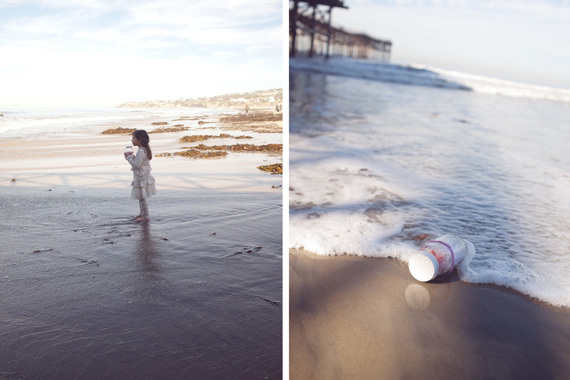 We stood with feet in the waves casting out our jars of Christmas joy. We sent them off with hopes that they would be found by someone in need of a little holiday cheer." Read the full blog article here. 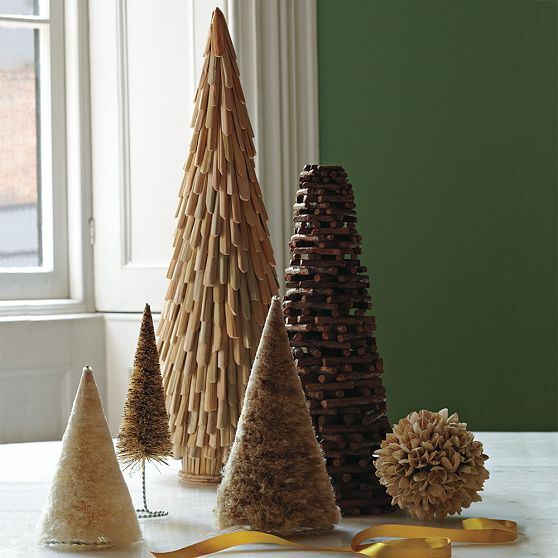 Feeling like making your own decorations? 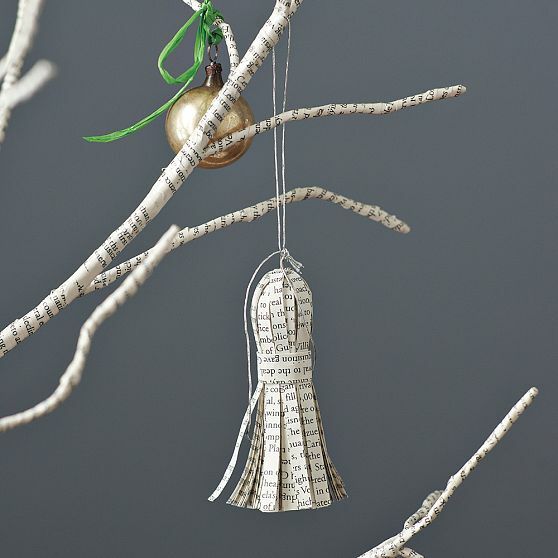 Here's a great example of how to use newspapers and make your own recycled ornaments! 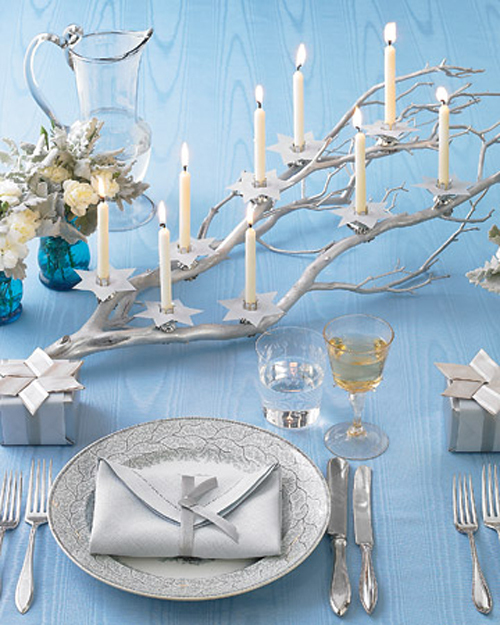 “Reinvent the traditional holiday hearth with a thoroughly modern indoor wonderland. 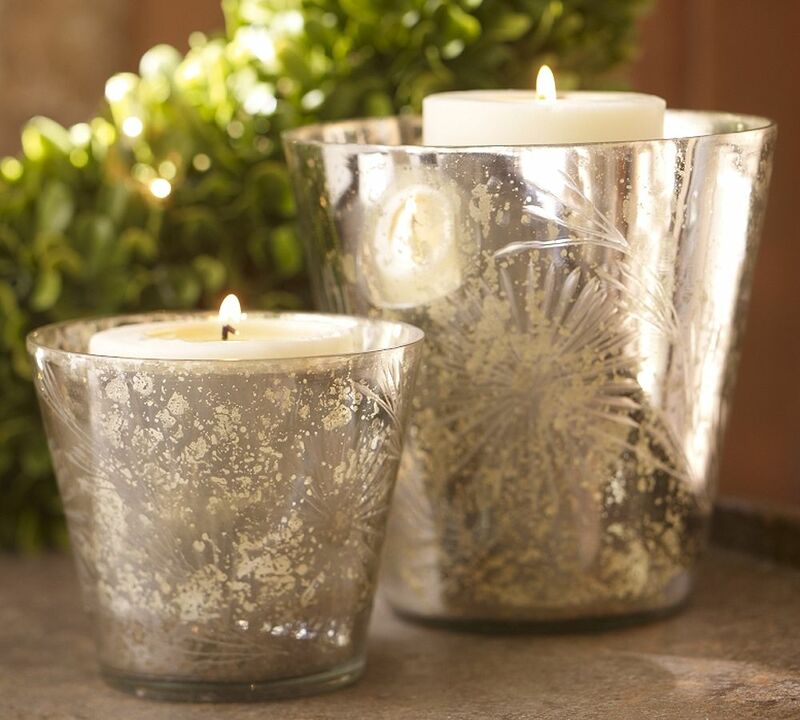 A dramatic sweep of light glows from clean sculptural shapes and a resplendent textural mix of glass and silver. “ West Elm has most of the decor elements anyone can use in a condo space. 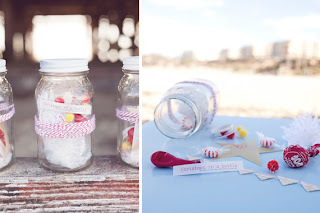 And remember to have fun while you decorate! too many people look at what they are not allowed to do when decorating a condo vs how many great fun opportunities they have!